- Why do some people slip into a new culture easily and others stumble for footing? In this age of frequent international travel, businesspeople and visitors alike depend on acquiring new skills. Yet, feeling at ease in a new culture requires more than just skill building and knowing the customs and etiquette. At the heart of it is a clear understanding of one's own personality. In this innovative approach to understanding culture and succeeding in business abroad, Alan Cornes shows how our psychological make-up plays a fundamental part in encountering a new city, a new culture, a new environment. Culture from the Inside Out takes readers on a deeply personal journey to discover the first people we meet when stepping on foreign shores: ourselves. Cornes shows us how to learn culture -- our own and others -- from the inside out. By exploring self-imposed barriers and our perception of ourselves, Cornes helps us examine our tolerance for ambiguity, empathy, flexibility and sensory acuity -- all elements that affect our ability to get along in unfamiliar surroundings. He inspires us to overcome cultural anxiety and suggests positive approaches to the challenges of crossing cultures. 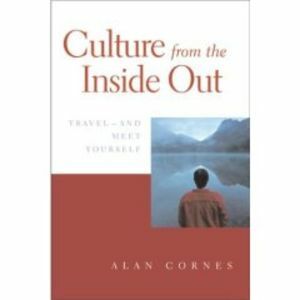 Culture from the Inside Out provides any traveler, seasoned or beginner, with effective strategies for success.